I noticed a lot of nature photographers are using F-Stop backpacks so I decided I’d like to try one out to possibly replace my ThinkTANK Airport Accelerator backpack. I don’t really have a problem with that pack, I just thought I might like a change and also see what everybody liked about the F-Stop stuff. The ThinkTANK was the backpack I’ve used the longest, and like all ThinkTANK products, it is extremely well made and well-designed. I spoke with a few of the F-Stop users to try and gauge what model might be best for me as I was looking at the “Loka”, the “Tilopa” and the “Satori” models. I ended up going with the Tilopa in Foliage Green. It can accommodate the XL Internal Camera Unit and I was pretty sure I wanted the XL. The Loka which was my first choice only goes up to a Large. After receiving my Tilopa, I could tell straight away that the bag was REALLY well made using premium parts…and it’s probably the coolest looking photography backpack around for what that’s worth. Unfortunately, that’s where the good ceased – at least for me. I’m only 6’1″ tall, but I am a bigger guy. Robust maybe? You know…I’m a solid “power forward” on my hockey team (that’s what they call us big dudes that are hard to move from in front of the net!) Now I know other users who are taller than I am, 6’3″, 6’4″, etc. and they told me that the Tilopa fits them fine, but I must be longer in the torso perhaps because I couldn’t get the pack adjusted to sit correctly on my hips (which is crucial to good backpack fit). The space between the shoulder straps was also a bit too narrow for a good fit on me as well. I have no doubt that a slender person my height could probably get this pack to fit like a glove, but it definitely didn’t work too well for me! 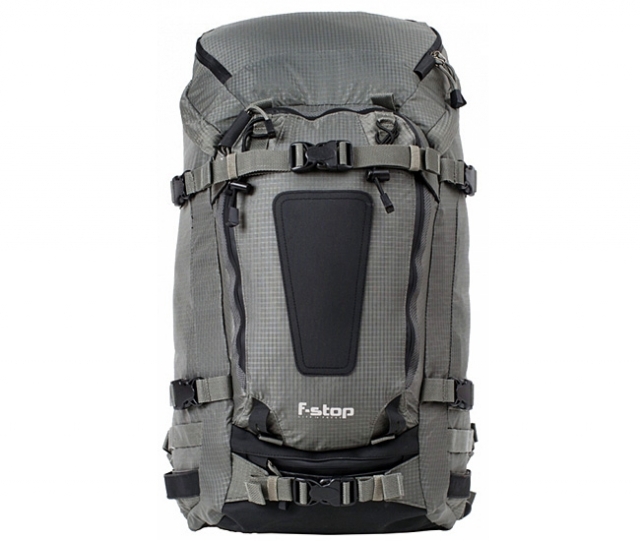 Strange how you only see skinny guys in the pictures on ALL the backpack manufacturer’s websites! If you are a bigger guy like me, I would strongly suggest you really check the dimensions of the packs before you buy. I did, and really had reservations about the fit, but was told by a lot of others including the extremely nice staff at F-Stop that the pack is really adjustable and I shouldn’t have any problems. With only about half the gear that I would normally put in the pack, I could tell within 10-15 minutes that it wasn’t going to be the right pack for my body type. This is really no fault of F-Stop – their website has lots of size measurements and pictures – I was just hoping against better judgement that I’d be happy with the Tilopa. The internal camera unit (or ICU as F-STop calls them) was also not great to work with. Even though I bought the “Pro” sized XL ICU, my Nikon D4 with Kirk Enterprises L-Bracket was not a good fit. I really had to push and cram it into the ICU with a Nikon 24-70 f/2.8 lens attached, the girth of the lens was too much to fit comfortably in the area where it should fit easily. There’s no way to put a wide angle zoom into the ICU like I normally do in other packs with the hood attached. Also, the F-Stop website makes it look like you’ll have a few inches above the XL Pro ICU when you open the main top compartment to maybe stick a hat and gloves in or maybe a bottle of water, but in reality there isn’t really any room left there when the XL is in place. When installed in the Tilopa, the top 3-4 inches or so of the XL ICU isn’t even accessible through the zippered back panel OR the top of the bag so you can’t really put anything in that area that you would need unless you want to slide the ICU in and out of the pack every time, so I would basically say the Large would be the biggest ICU you can effectively use in the Tilopa. I have my ThinkTANK pack set up basically in a 2-sided arrangement in the upper portion of the bag so I can put the D4 with either the 24-70 f/2.8 or 16-35 f/4 attached on one side and the 70-200 f/2.8 with 2x converter on the other side. If I have the 70-200 attached to the body, it’ll still fit on one of the sides and the other lenses still have a place to go. This way, I can throw the camera right into the pack no matter what lens is attached to it – quick and easy. I don’t have to take a lens off in order to get the camera into the pack. Quite frankly, the D4 with the 70-200 attached wouldn’t go into F-Stop pack easily at all. This is reason enough for me to just return the Tilopa and continue using my ThinkTANK pack, but add in the fact that it’s just not a good fit for me personally and there’s no other decision to make except use F-Stop’s nice 45-day return policy and get a refund. I must mention that the people I spoke with at F-Stop were super friendly and helpful and that up to this point I believe F-Stop is a good company to deal with…we’ll see how the return goes but I don’t have any reason to doubt it’ll go smoothly. UPDATE: I called F-Stop to return the Tilopa and once again talked to an extremely nice and helpful employee – he arranged an email to be sent to me that included all the return information and an RMA number. Big props to F-Stop’s customer service. I will more than likely revisit F-Stop in the future – hopefully they’ll have a pack that will fit me better in the future. I think this would be a fantastic pack for a big mirrorless kit with a bunch of lenses (smaller bodies, smaller lenses), but by the time I was really building my mirrorless kit, I already had the Gura Gear Uinta pack. You can see in this pic how I have my ThinkTANK Airport Accelerator set up so I can fit the D4 in on either side with any lens I use on it – the 70-200’s hood comes off, but all the other lenses can go in with hoods attached. For reference, you can see pretty easily in this pic that the XL Pro ICU in the F-Stop pack makes for a tight fit for the pro-sized Nikon D4 and the 24-70 (attached) and the 70-200 on the left. You can also see how the upper most compartments in the ICU aren’t really accessible at the top of the opening.